Note : The faces of some of the people in the post are not shown for public view for privacy reasons. Warning : The girls in the picture are my relatives. They have given me permission to write about this incident in my blog. Don't you dare mess with them. Becky (Red T shirt) and Kintoo (Green T shirt) were taking a stroll to get some groceries. These two girls are cousins and also great friends. They come across a wedding hall where they hear amazing music. The dancing spirit inside them awakens them and they are drawn into the hall by the music. They did not plan to gate crash at a wedding reception. But they were inside the hall. So here are two girls inside a wedding reception auditorium. 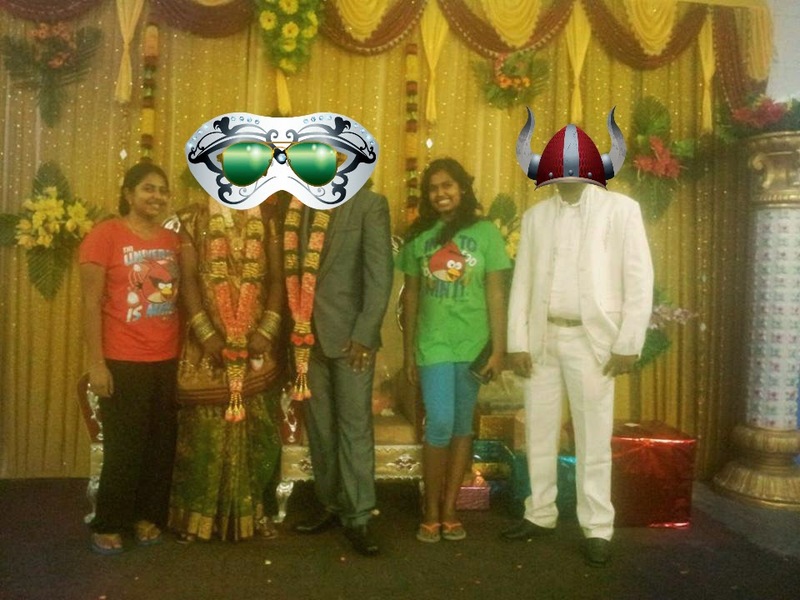 All the ladies decked up in sarees and the Men in Veshti and Formal attire and our two ladies were standing there in a green and red angry bird T shirts and bathroom slippers. Becky and Kintoo looked at the couple and had no idea who they were nor did they know anyone in that hall. Noticing two girls loitering near the entrance, the grandfather of the groom called the brother of the groom and asked him to welcome the two lovely ladies. So the brother of the groom ( White color attire in the picture) invited them and made them sit. The two girls could have just sat there, sipped on some juice and left the place; but they decided to take this one step forward. I do not know if it was Becky's idea or Kintoo's; they made their mind not to leave that place without meeting the couple and wishing them. So the next minute, these two girls stand in the queue and walked up to the stage. When the couple saw them, they had no idea who these two girls were. Yet they had to pretend like they did know them. So they gave the usual broad smile. Becky decided to break the suspense and she whispered to the bride ," Hey you don't know us and we don't know you. Please pardon the way we are dressed. We just wanna wish you an amazing married life". The bride and the groom laughed at her truthfulness and thanked both of them. This is when the brother of the groom ran to the stage and introduced Becky and Kintoo as his friends to the couple. They pose for a picture and when they came down, they danced for a while to the lovely music. They were also offered dinner but they did not eat because they got a call from home asking them to bring the 1/2 kg tomatoes to cook for dinner at home. Additional Information : The brother of the groom did not get Becky's and Kintoo's phone numbers.